It finally feels like spring here! After a cold March and a chilly April, we’re having nice warm weather for the first time this spring. The cherry blossoms are beginning to bloom, and gorgeous spring vegetables are everywhere. Among them are asparagus, of course. Another spring treasure is tender, thin green onions. They are called shilpa (실파) in Korean, which means thin as a thread, is more common. They are mild and slightly sweet. I decided to put these two beautiful spring vegetables together for these little rolls that are great as an appetizer or a side dish. 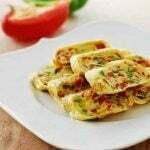 Ganghwe (강회) is a general term that refers to a dish, of small rolls, that is made by tying an ingredient(s) with a thin green onion or minari (water dropwart). It’s a spring favorite in Korea. They are prepared in bite size pieces and served with a dipping sauce. Nakji (octopus) ganghwe, ojingeo (squid) ganghwe are common variations. There are elaborate royal cuisine versions as well. I used shrimp and asparagus. Don’t be daunted by the look of this dish. It’s not that hard to tie the ingredients together once you get a hang of it. 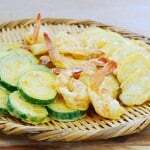 Also, try it with octopus, squid, imitation crab meat or colorful vegetables. 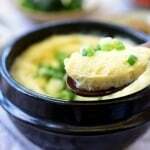 You’ll surely be able to impress your family or guests with these little Korean delicacies. Bring a medium pot of water to a boil. Add the shrimp, and cook briefly, about a minute. Quickly drain and dump in cold water to stop cooking. Drain. You can cut small slits on the inner curve of the curled up shrimp to flatten a little for easier wrapping. 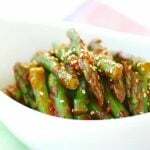 Remove the tough ends of the asparagus. Cut into about 2-inch lengths. Blanch them in salted boiling water until softened, about a minute. Remove with a strainer, and shock in cold water. Drain. To the same pot of boiling water, add the white parts of the green onions, and hold for about 30 seconds before submerging the whole scallions briefly to soften, about 20 seconds. Drain, and shock in cold water. Pat the green onions dry with a kitchen towel or paper towel by gently pressing to remove excess water. To assemble, hold a shrimp and an asparagus piece together along with the white end of a green onion. 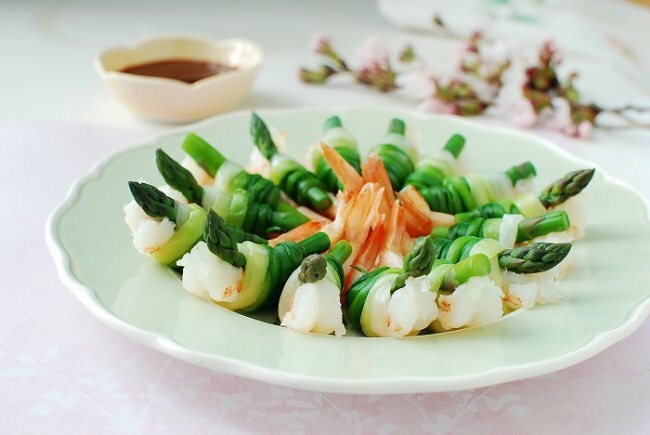 Tie them together by wrapping the other end of the green onion around the shrimp and asparagus several times. Use a chopstick or a toothpick to tuck the end of the green onion into the roll. 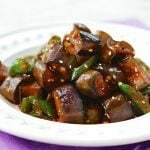 Serve with the gochujang sauce. 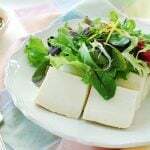 Tha is a very healthy and fresh looking dish! Beautifully done!